County, of which Hagerstown is the Capital, is one among the first of the wheat producing counties in the United States, and other cereals can be largely grown. Of Fruit—apples of every variety are grown to great perfection, and of late years it has been demonstrated that peaches and grapes can be grown most successfully for market, in consequence of which, many thousand peach trees and grape vines are planted each year. 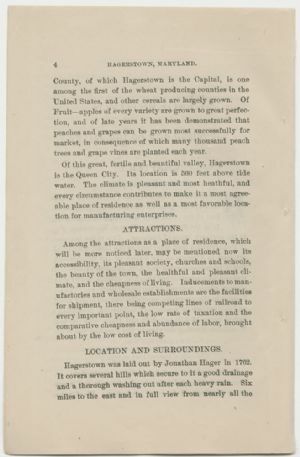 Of this great, fertile and beautiful valley, Hagerstown is the Queen City. Its location is 560 feet above tide-water. The climate is pleasant and most healthful. and every circumstance contributes to make it a most agreeable place of residence as well as a most favorable location for manufacturing enterprises. Among the attractions as a place of residence, which will he more noticed later, may be mentioned now its accessibility, its pleasant society, churches and schools, the beauty of the town, the healthful and pleasant climate, and the cheapness of living. Inducements to manufactories and wholesale establishments are the facilities for shipment, there being competing lines of railroad to every important point, the low rate of taxation and the comparative cheapness and abundance of labor, brought about by the low cost of living.